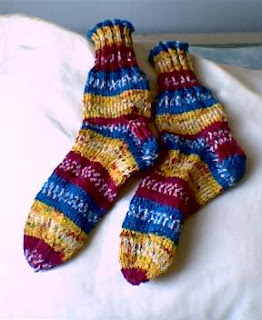 I finished the child's socks for Afghans for Afghans. For once, I managed to get the stripes to match up--more or less. The primary colors are very cheerful. Since I still have a couple of weeks before the socks have to be sent to San Francisco, I'm going to attempt another pair. They're going to be a little bigger and in an autumnal colorway. In baby cardigan news, I finished the body and am almost done with the right sleeve. 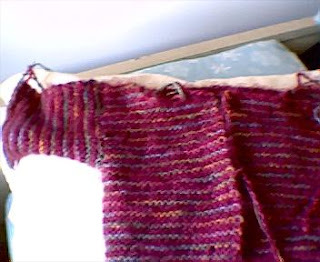 It needs just a few more rows before I bind it off. That's it for this weekend. Happy knitting! Thanks! It's the first time I've done that successfully. 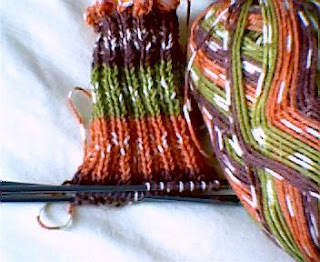 Sometimes I suspect that they wind the skeins in opposite directions, because despite my care in starting the second sock at exactly the same spot in the color repeat, they don't match up. So I'm happy that it worked this time.